Look, I'm an old-school guy. There's no getting around it, especially as I start to realize that I don't even recognize the titles of many of the current releases in the anime world, let alone their creators, their plots, and so on and so forth. Am I with it enough to know about shows like Flag and Bleach and Aria? Yes, though the last one of those only because it came recommended by a friend in Norway. The truth is, I am not all that concerned with learning about all the latest programs. It used to be that there were some gatekeepers...for good or for bad, the anime companies in the US limited the total flow to things they thought would sell. Most of the classic anime I ever wanted to see got released that way (with a few notable exceptions). But now the floodgates are open, and there are tons of shows available, whether through legitimate DVD releases or Torrent downloads or whatever. But most of them don't interest me. Just like I have maybe 6 shows on American TV I follow, I do the same with anime. I just can't follow it all. But perhaps more importantly, because the gatekeeping system is gone, there's very little interest on the part of most anime viewers in finding the classics, or at least the anime that once ruled the scene. I don't find myself necessarily wanting to be Justin Sevakis over at Anime News Network writing Buried Treasure articles, though it's one of the most valuable anime columns on the web today. But occasionally, I do want to go back and find the shows that I missed. And the one that crossed my radar recently was Aura Battler Dunbine. As far as its American release, it appears to have been a big failure. From all reports, this 12-volume series nearly didn't get completed, and only a relative handful of copies of volume 11 ever made it to store shelves (sending the used price on Amazon well over $100). But after watching the first volume, it's clear to me why ADV took the risk. A mecha show from famed Gundam director Yoshiyuki Tomino, it ran for forty-nine episodes and spawned a few OVAs as well. Though never as popular as Gundam, there can be no doubt that Dunbine was well respected. While there are glaring reasons why this show was a non-starter in the US shortly after the turn of the millennium when it was released here, the opening shows great promise despite some minor faults. Show Zama is a motocross rider who, during a freeway chase, suddenly finds himself pulled to the world of Byston Well. 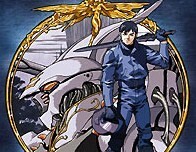 He is immediately recruited by Drake Luft to become pilot of the Aura Battler known as Dunbine. It turns out that humans from the "upper" world -- that is to say, the Earth that we know -- have a particular aura that allows them to pilot mechanical ships with great ease. While the people of Byston Well can use certain mecha on their own, they are nowhere near as complicated. In essence, the people of the various lands of Byston Well need to steal folks to come fight their wars for them. Show and a few other recruits agree to join the fray, primarily because they are told the only way they are going to get home is to win. The real problem arises when Show meets enemy pilot Marvel...and he realizes that he is almost certainly fighting for the wrong side! Show starts to realize his error and attempts to defect. But when there are battles to be fought, a Romeo and Juliet to reunite, and unpredictable fairies to argue with, who knows what the outcome will be? Aura Battler Dunbine was released in 1983, and it looks exactly like what you might expect from that era. The character designs are good and the mecha are interesting, and the fight scenes tend to be well-choreographed and animated. However, the majority of the time, there is little to no motion and the characters (when they do move) look bad. There's very little eye candy on display. From a storytelling perspective, the only issue I have with it is that it is distracting at times, even for a fan of old-school designs like me. But as the five episodes on the disc went on, I noticed it less and less. What attracted me to the show was that it is complex without being ridiculous to follow. There are several lands at war and several Battlers, and keeping track of them can be a little laborious. However, it's really the names that are difficult to track, not the plot. The cliché of a lone warrior getting called into another world to fight, not unlike say The Last Starfighter, gets turned on its head when it becomes very clear that Show has been pulled into a war he doesn't understand. While I wish the characters were more fully realized -- for example, Show has no real background other than being a biker, and his two companions to Byston Well are an amiable but bland Russian and a ridiculously racist American -- the show moves at a pace that makes me think we'll see more development along the way. The show, in this first volume, simply takes its time elaborating on its setup. I for one liked the way it moved; it was a show that never bored, even though it might be considered slow by some. And when the action does ramp up, it's usually very good. Mecha in a fantasy world isn't unheard of, but here it makes for an interesting combination. The only real issue that I had with Dunbine is the way it treated its female characters. Most of them are highly passionate, but they are also way too emotionally charged and they tend to do stupid things because of those emotions. For example, one episode deals with the ramifications of a young girl who runs away (more or less) because she's not being noticed by a prince who's enamored with another. The fairies, all women so far, are grouchy; even the two heroines leave all logic behind on many occasions. It bothered me enough that it does affect the letter grade, though not totally. Those who are offended by weak female characters may have difficulties with this one. In the past, I've never lowered my grade due to the availability of a title, though I considered it here, since a long-running series whose ending can't be found would be disastrous. However, like many programs, Dunbine can be found easily enough on the Internet. While I would strongly encourage you to purchase the series from regular retailers up to the volumes that are available -- and you can find through volume 8 without much problem -- this is a show that I actually wouldn't recommend unless you have a decent enough Internet connection and enough web-hunting savvy to find the whole thing. I admit that I've had this disc in hand for a long time, but I avoided it because I knew I probably couldn't finish it. But after viewing it, I consider it less of a problem. If you like it, you'll find a way to see it. Overall, the first volume of Aura Battler Dunbine does a good job of setting the stage for what is to come. If you like old-school anime, then I suggest giving it a try. You may find a few things questionable, but I think it looks like a fascinating world to discover.